1. The Wallflowers are a rock band which formed in 1989 in Los Angeles, California, United States. The band's only constant member has been singer/guitarist Jakob Dylan, the son of folk rock legend Bob Dylan. The Wallflowers have released five albums: "The Wallflowers" (1992), "Bringing Down the Horse" (1996), "Breach" (2000), "Red Letter Days" (2002) and "Rebel, Sweetheart" (2005). The band is best known for their hit singles "One Headlight", "6th Avenue Heartache", "Three Marlenas" and "The Difference", all from their second album "Bringing Down the Horse". 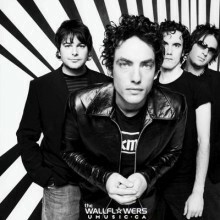 The original members of the Wallflowers included Jakob Dylan (vocals and guitar), Barrie Maguire (bass guitar and vocals), Peter Yanowitz (drums and percussion), Rami Jaffee (keyboards and vocals), and Tobi Miller (guitar). Peter Yanowitz and Barrie Maguire left the band shortly after the album's release and went on to join Natalie Merchant's band. The band currently consists of Jakob Dylan (vocals and guitar), Greg Richling (bass) and Fred Elthringham (drums). Although not an original member, Richling has been in the band longer than any other member aside from Dylan, joining in 1996. Elthringham joined in 2005. The band left Interscope Records in 2005, and currently do not have a record deal, but the band has toured constantly since 2006. 2. The Wallflowers is also the name of UK 80's indie pop/jangle band, which released a number of singles. Darling fans if you are reading this, you clicked on the page of the recording artist wallflowers in our eLyricsWorld. Our database has data about 52389 artists from all over the world as well as 829824 songs 83 of which are from wallflowers. Besides the artist's biography, on this page you can see brief information about them, enlists birthdate, style, record label Be conversant with all the events around wallflowers by adding RSS feed. If you prefer you could directly visit the page you are on right now and check out the latest songs about the artist.